Next (2011) November, on the 11th, people will be able to abbreviate the date as 11-11-11. Symmetric but of no particular importance. As unusual dates do, this one has generated some chatter. Sundry religious, numerological, and New Age devotees have all decreed the day to be vitally important and expect it to be accompanied by bands of angels, spirit brothers returning to Earth, prophetic fulfillments, reptilian invasions, armadas of flying saucers, portal openings, parades of Bigfoots (Bigfeet? ), weight loss without exercise or dieting, and lotto winnings. There are websites, pamphlets, books, DVDs, and t-shirts. They're even making a movie, 11-11-11, to be released on November 11, 2011 about an ancient prophecy fulfilled by the date and the opening of a cosmic portal. Except for the movie, none of this is likely to happen. November 11, 2011 will most probably be just an ordinary day. Something actually happened that 11-11-11. That day saw one of the weirdest, wildest days of weather the Midwest has ever known: record-breaking heat, record-breaking cold, violent thunderstorms, tornados, and blizzards all in the same day. November 11, 1911 has the distinction of being the only day in history when many Midwestern cities set both a record high and a record low in a 24 hour period. The culprit was an area of extreme low pressure moving southeast out of the Great Plains. In advance of the front, the powerful air circulation around the low pulled warm, summery air up from the Deep South and the Gulf of Mexico. Behind the front, the circulation pulled cold, wintry air down from Canada and the Arctic. On the ground, the effect was balmy, unseasonable weather followed, as soon as the front passed through, by a sudden dramatic drop in temperature. Violent storms exploded where the cold air and hot air met. The trouble started on the afternoon of Saturday, November 11 along a broad front that stretched from Michigan all the way down to Texas. Throughout the afternoon, the front advanced sourtheastward, bringing dramatic temperature drops. In Oklahoma City at the southern edge of the system, temperatures dropped 66 degrees from 83°F at noon (a record high) to 17° at midnight (a record low). In Springfield, Missouri, temperatures dropped from 80° to 13°. Chicago fell from 74° to 13°. Cleveland fell from 70° to 18°. This dramatic temperature change led to strange occurrences. Legend has it that a Chicago hospital admitted a worker for heat stroke in the afternoon then treated victims of frostbite in the evening. The front also brought high winds, violent storms and tornados. Wisconsin, Michigan, Illinois, and Indiana were hard hit. 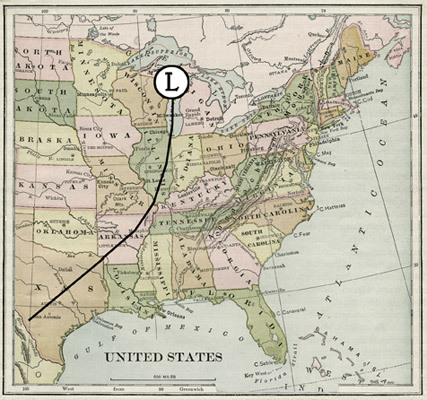 About 4 pm, Janesville, Wisconsin was hit by an F4 tornado and erased from the map. Nine persons were killed, scores injured, and massive damage done to homes, factories, and other structures. The storm drove a 6" x 6" timber through a cow, wrapped a buggy around a tree so that the front and back wheels touched, and carried a cast iron stove for two miles. The storm blacked out the city of Chicago and caused tens of thousands in damages. Late in the afternoon, the villages of Virginia and Easton, Illinois were devastated by tornados. Two were killed. Chaos reigned on Lake Michigan as evening fell. High winds, huge waves, and blizzard conditions wreaked havoc on shipping. A fishing boat went down in rough water and its crew of 17 all perished. Docked boats were torn from their moorings and set adrift. Several big freighters out on the lake were driven aground. Others vessels narrowly avoided sinking. At 11:11 pm on 11-11-11, homes and factories were flattened in Owosso, Michigan when a tornado struck town. Several tornados touched down in Indiana, wreaking buildings and causing many injuries. 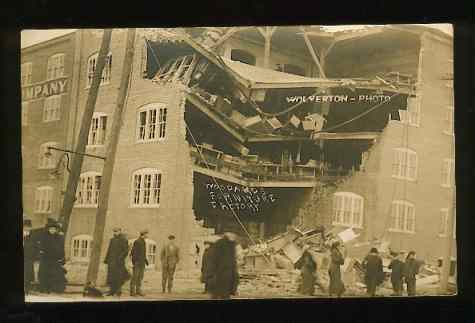 About 11 pm, an F2 tornado struck Waterloo, Indiana, destroying buildings, collapsing the opera house, throwing freight train cars about, and killing 2 people. Late on the 11th, a good section of Bedford, Indiana was smashed by a tornado. Traffic on the Southern Indiana railroad line was stopped by the debris of the town strewn across the tracks. As survivors looked for shelter and rescuers tried to find the injured in the pitch black night, sudden cold, ice, snow, and howling winds punished them cruelly. In many places, near blizzard conditions prevailed after the front passed through. Several people froze to death. Position of the low pressure area and the cold front about 8 pm EST on November 11, 1911. 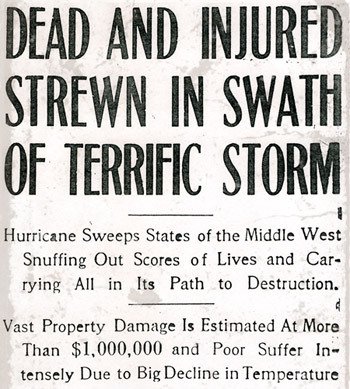 The storm didn’t reach Columbus until the wee hours of Sunday morning, November 12. Saturday had been sunny and warm and temperatures had climbed to 70, just a degree shy of a record for that date. It was a day for long walks, picnics, sitting on the porch, impromptu baseball games, and leaving coats and jackets at home. People of the city did spring and summer things against the incongruous back-drop of bare trees, dead leaves, and brown lawns. Ohio Field on High St. was crowded with cheering football fans as Ohio State shut out Kenyon 24-0. Despite the early darkness, shops, restaurants, dance halls, and theaters were busy that evening as people savored the fine weather. Indianola Park and nearby Smith's Dancing Pavilion were packed with couples enjoying the evening. Well after midnight, the temperature was still a summer-like 70. In the University District and around the city, many people were sleeping with their bedroom windows open. The front hit about 3 am, announced by violent lightning and resounding thunder that woke most of the city. Winds of 40-60 mph tore through the city, inflicting damage in all quarters. Trees were torn up by their roots in many areas. Fallen trees and limbs clogged streets, damaged roofs, and smashed autos parked in the street. Power lines were knocked down, blackening wide swaths of the city. Plate glass windows were shattered in several buildings downtown. In the Short North, the winds utterly destroyed the Hi-Starr Airdome, a kind of walled-off yard that showed movies outdoors in the summer. Many billboards and signs were destroyed and strewn about the city. Downtown, a large billboard was blown off a building at Broad and High and hung precariously in the wires over the intersection. Daring firemen braved the wind, rain, snow, and lightning to get it down. Headline on November 13, 1911 edition of The Columbus Citizen. Trains were stopped or delayed by fallen limbs and trees across the tracks. South of town, telegraph poles were snapped off by the wind and dropped in the path of the interurban, stopping it until crews could clear the tracks. As the front passed, the heavens opened and a torrential rain fell, dropping an inch of water in a few minutes in some parts of the city. Overwhelmed street drains backed up, flooding streets and creating logjams of downed tree branches. While the city reeled from the impact of the storm, the temperature plummeted. In one hour, between 3 and 4 am, the temperature fell 21 degrees, dropping from 70 to 49. Temperatures continued falling. By dawn, it was below freezing. Columbusites who had been walking around in shirtsleeves on Saturday afternoon made their way to church Sunday morning in a light snow, with ice forming on the puddles, and a bitter wind blowing out of the northwest. The mercury kept dropping through the day. It was 20 at noon, a full 50 degrees colder than the previous day. By night, it was 16—a new record low for a day that started with temperatures within a degree of the record high. Overnight, the temperature went down to 14. In 24 hours, the city had seen the temperature fall 56 degrees—another record. One of the sayings you always hear around Columbus is “Don’t like the weather? Wait a minute.” Usually, it’s a an exaggeration but on November 11 and 12, 1911, it was true.